On a recent edition of the Spotrac.com Podcast, co-hosted by myself and Kevin Sylvester, Spotrac founder Mike Ginnitti was analyzing the contract and future earning potential of Angels outfielder Mike Trout. During the podcast, Mike stated that he thinks Trout is on pace to be the greatest baseball player of alltime. Baseball’s G.O.A.T. That got me thinking…who do we all think is that player right now? Is there a consensus opinion of baseball’s best? At least until Trout takes that title. I actually struggled a bit with my own decision. The common names popped into my head right away…Ruth, Mays, Williams, Aaron, Cobb…and so did modern candidates like Griffey Jr, Bonds and A-Rod. But that only clouded my mind. Two of those recent names are tied to PED use, and does that eliminate them from consideration? I’ve been a big baseball fan for most of my 52 years. Developing a love for the sport in the early 1970’s allowed me to understand and sometimes even experience greats from the 1950’s & 1960’s like Williams, Yastrzemski, Gibson, Aaron and Musial. Growing up in New Jersey exposed me to far too many Yankee fans and their admiration for Ruth, Mantle, Berra and DiMaggio. So you can see why my mind was a bit clouded by the question. A quick search online turns up plenty of lists, such as this Bleacher Report Top 25. Even Kevin, Mike and myself couldn’t come up with a definitive answer when we talked about it right after the podcast recording was over. So here’s a breakdown of the names that we talked about, from different eras and with different circumstances. I’ll give you my final answer at the end. They are the names that every baseball fan knows, even if they played nearly 100 years ago. Babe Ruth is the first that comes to mind. He was as good a pitcher as he was a hitter, and there has never been as prodigious a power hitter in an era when that wasn’t the norm. He’s an easy choice, and the one most often picked for these lists. But was he enough of an all-around player? Should that be held against him? The great Yankees like Joe DiMaggio and Mickey Mantle will top the list if you ask it in New York City. Everything I’ve ever been told or read about them emphasized their ability to do so many things well. Both were ahead of their time. Williams is an easy choice for best hitter ever. Is that enough? Hank Aaron was the best long ball hitter, and good in so many other ways. Is that enough? Players are so much more well-rounded today, and much better athletes. But does that diminish Ty Cobb, Honus Wagner or Jimmie Foxx? Can a pitcher top this list? That will start a different argument. If so, then legends like Cy Young and Walter Johnson belong in the discussion. Modern hurlers like Nolan Ryan, Bob Gibson and Greg Maddux should warrant inclusion. I have a hard time making a pitcher the greatest of all time. All those guys were dominant…once every 4-5 days. For me, that’s not enough. Take away the PED issue, Bonds and A-Rod would be easy picks. They were well-rounded, hit for average and power, had speed, and played great defense. Isn’t that what you’d want in a G.O.A.T.? But it’s hard to make that choice without wondering how the drug use enabled and extended their careers. For me, I can’t include them. Ken Griffey Jr. was one of the first names to pop into my head. In my adult life, he was as talented a player as I have ever seen. But injuries sapped some of his stardom, and maybe enough to take him out of the running. I was always partial to George Brett, one of my favorites. He could do it all and nearly hit .400. Albert Pujols has been a similar player too. Cal Ripken Jr. belongs in the discussion, although I feel like I never think of him as great, just consistently very good. Pete Rose was a trailblazer, but with baggage. His Reds teammate Johnny Bench was one of the best catchers I’ve ever seen. But I don’t think I can put them at #1. 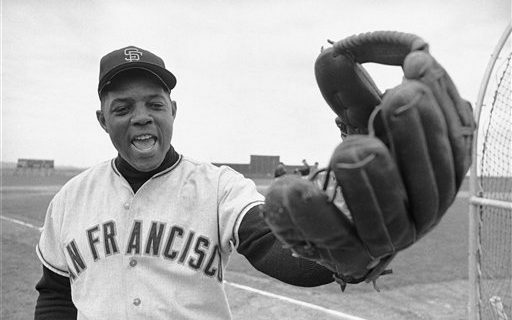 The name that came up the most in discussions with friends was Willie Mays. He was one of the best athletes baseball has ever seen. He could do it all. A .302 career average, over 600 home runs and a golden glove. For me, a good choice. My only problem is that I saw him play the end of his career with the Mets, when he was a 40 year old shell of himself. I have to get beyond that. So that leaves Babe Ruth. All any of us have seen are the black and white films, and we’ve read the legendary stories of his power and excess. But the fact that he was an incredible pitcher, before becoming the greatest power hitter of alltime, is enough for me. I feel like it’s a bit of a cop out, because that’s what we’ve been told all our lives. But it’s hard to argue with the numbers. Even modern day analytics crown Babe #1. Trout will have to overcome the fact that all we know about Ruth is the legends and stories. We see Trout every day. Can he pass the Babe? Sure. But I doubt that most baseball fans will give him the nod, no matter how many numbers he puts up. The Babe is a mythical god in our baseball minds. That’s tough to overcome. My G.O.A.T. pick? Babe Ruth. Who’s yours? Do you disagree with my choices? Did I leave anyone out? Comment here or on our Facebook & Twitter pages.